We’ve all been there. Somewhere in the glossy pages of the latest fashion magazine or displayed delicately at a boutique, we spot it. It’s effortless. It’s chic. It’s the pièce de résistance your wardrobe has been missing all these years. Then you look at the price tag and your dreams of purchasing that special piece are dashed. No matter how many days you bring lunch to work or brew coffee at home, you’ll never save up enough from a few weeks of penny pinching to make that of-the-moment item your own. Don’t be discouraged, though. A quality, thoughtful wardrobe is accessible on a budget with a strategic approach to wardrobe building. Below, you’ll discover the key places to splurge and where to save. And if you’re strapped for cash, a good rule of thumb is to go with budget-friendly pieces in classic shapes and neutral colors. Those can usually pass for a more expensive alternative in a pinch. The lion’s share of your budget should go toward the pieces you wear most often. While “cost per wear” can come off as a fashion lover’s rationalization for spending money, there’s value in the practice. For example, an ultra-trendy romper purchased for $200 and worn twice comes out to a $100 cost per wear. That’s a huge chunk of your budget for an item that didn’t get much love. On the other hand, spending $200 on a handbag you reach for three times a week throughout the year only comes out to $1.28 per wear. That’s the better investment for your dollar. You’ll also want to spend more on these often-worn items because they are more likely to withstand the stress of regular use. A higher price tag doesn’t always mean better quality, but it usually does. Be sure to read product reviews and scour blogs to find testimonials about an item or brand. The right splurge for you is dependent on your lifestyle and sartorial preferences. If you live in a warm climate, then a heavy wool coat obviously isn’t for you. If you’re like me, then dresses are a staple in your collection and spending more on a single dress that fits like a glove is worth every cent. 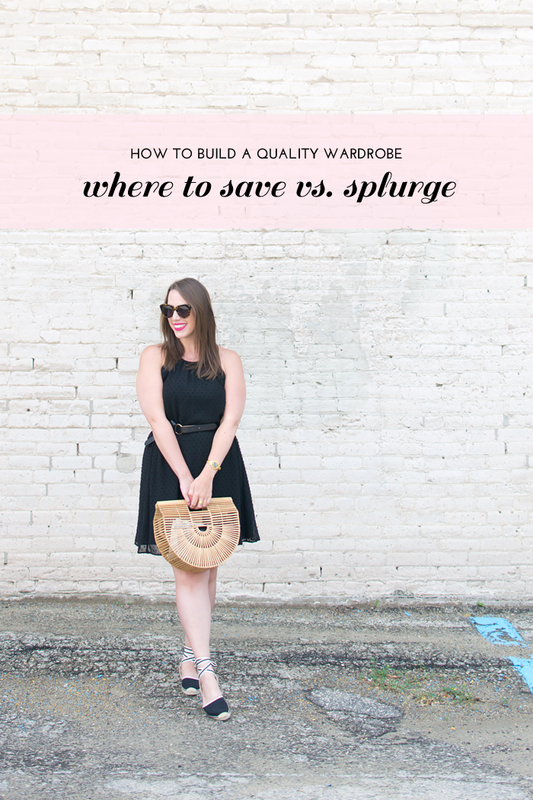 Use the guidelines below as inspiration for creating your own splurge list. Outerwear – No matter where you live, you need a quality piece of outerwear. It needs to keep you warm or dry (often both) and a budget find isn’t going to make the cut. Choose a coat that’s best for your climate and invest in a classic piece you’ll wear for years, like a wool coat, a trench, or peacoat. Opt for a wear-with-everything neutral like black or camel. Cashmere – Cheap cashmere often feels, well, cheap. This is an area you don’t want to skimp because a good cashmere sweater or scarf will retain its shape and loft for years. You can find some good quality cashmere pieces at modest prices at retailers like Lands’ End or Garnet Hill, but you’ll want to feel them in person before committing. Work Staples – I know this is a wishy-washy category because it’s so dependent on where you work and your personal style, so you’ll need to evaluate what types of pieces you reach for over and over again. Do you love your black pants because they go with many colorful tops? Is your a-line skirt the workhorse of your 9-to-5 wardrobe? Do you live in shift dresses? Do you need a quality suit? Once you identify the pieces you wear to the office just about every week, you can rest assured that spending money to upgrade your basics will be money well spent. Shoes – Synthetic materials, thin soles, and shoddy stitching should be reasons enough to keep you far away from budget shoes. Your shoes take quite a beating outside and while you might be tempted by the trendy styles of cheaper pairs, expensive shoes are made to withstand that kind of wear. Good shoes will need some maintenance to keep them in good shape for as long as possible. Keep an eye on the sole and take them to a cobbler when it starts to look worn. Handbags – A beautiful leather handbag elevates a budget outfit like nothing else. Splurge on a classic shape in a neutral color and you’ll reach for it again and again. Many designer bags hold their value. If you find that you didn’t use a bag as often as you would have liked, you can sell it and likely get a portion of your money back to put toward something you will use. The most stylish women know how to mix those high-end purchases with budget finds. Think of the “save” column as the icing on the cake. These are the updated, trendy items that might not capture your fancy for more than a season and that’s okay. However, this is precisely why only a small portion of your budget should be dedicated to these pieces. It goes back to that cost per wear. Spending $50 on a sundress you wear once a week for the summer will run you around $4 per wear June through August — much easier to stomach than a higher priced version. Sundresses – Gauzy little sundresses shouldn’t cost an arm and a leg. Few are tailored, so an inflated price tag doesn’t make sense for an oversize, flowing fit. Besides, your tastes will likely change next year, so you’ll be glad you went the cheap route. [Some] Costume Jewelry – If you’re going to drop a small fortune on a piece of jewelry, it better be the real deal. However, I can’t recommend opting for the save version of all costume jewelry because you really can tell the difference between, say, a Target piece and a designer costume piece. The materials are better quality with the designer version, they rarely tarnish, the and the designs are more eye catching. However, if you can’t stomach spending a few hundred on costume gems, go vintage. Searching Etsy or eBay will rustle up great pieces at even better prices. Even better? You can smugly tell people it’s a vintage piece when they ask about. Swimwear – A bathing suit will get sandy and salty in the ocean, or full of chlorine in the pool. The same goes for your cover-up. Save your dollars for items you’ll wear away from the surf. I’d love to know what items you save and splurge on! Let me know in the comments! You might also enjoy this post on how to find and identify your personal style.